Every so often, a confluence of events brings about enlightenment. It’s how we got penicillin and harnessed electricity and learned how to fly. In the art world, it happens when paints mix together fortuitously or musical notes embrace in harmony or Warner Brothers produces The Maltese Falcon three times before they get it right. As an educator, I know that enlightenment can occur at any time: a series of facts can gel perfectly; a body of existing knowledge can rearrange itself as a result of an offhand comment or a new opinion. Today, I received enlightenment about Agatha Christie. What do you get when you read Christie? Misdirection, sure. Tight plotting most of the time. A tendency to break the rules of classic detective fiction – but then, those rules were always just guidelines meant to be crossed. Perhaps you find a more than typical ruthlessness from a female author when it comes to assigning culpability for a crime. Christie is not your Wentworth-ian romantic or the creator of an inordinately loveable community of suspects like Brand. Some of the most charming or lovable people in her books turn out to be the killer, and no couple is safe from being torn asunder when one of them lands on the dock. Is there any specific aspect of the whodunit that Christie does particularly well? You know that if you pick up a book by John Dickson Carr, Rupert Penny, Noel Vindry or Paul Halter, you can be reasonably certain that it is going to center around an impossible crime. A Christopher Bush or Freeman Wills Crofts novel will, more likely than not, have something to do with unbreakable alibis. John Rhode features inventive murder methods. Craig Rice, Delano Ames and Kelley Roos cloak their crime stories in lunacy, while Mary Roberts Rinehart and Mignon G. Eberhart feature marriageable girls in jeopardy. And then something happened which offered me enlightenment on a specific type of mystery at which Christie excels, maybe more than anyone else of her era. In response to a review of The 8 Mansion Murders I posted last week, I received a visit to my blog from Ho-Ling Wong, who is not only one of the finest mystery bloggers on the internet but the translator of The 8 Mansion Murders for LRI. We discussed my two chief complaints about the novel, the first having to do with the comic tone – which, of course, is a matter of taste – and the other with the fact that after the method for two impossible crimes had been explained and the killer unmasked, all satisfactorily, the final explanation of motive was an anti-climactic letdown. 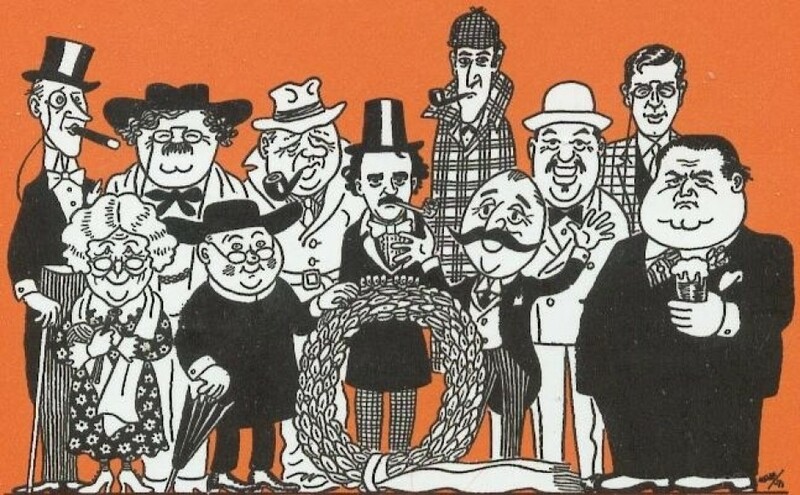 I include a link to Ho-Ling’s short story post here, and as so often happens with his blog, this one led, like those funny Russian dolls, to another post on clues and to some great insight on Ellery Queen. (Seriously, if you visit his blog site, you need to be prepared to stick around for a while!) Queen’s early work resembles a Dell magazine logic puzzle in long prose form: throughout the novel, he assembles a list of data about the killer which we must apply to each suspect until we find the person who is left-handed, plays canasta, ate chicken fingers within the last week, owns a white dog, and has an encyclopedic knowledge of the flora and fauna of southern Manitoba and – voila! you have found your killer! Queen abandoned this “puzzle is all” approach to mystery fiction in the mid- to late-30’s, and a fan’s preference for Queenian periods depends on which way you like your puzzles sliced: cold and precisely, laced with feminine emotions, or rich with psychological and spiritual angst. Why did Ho-Ling’s message to me resonate so strongly, filling me with psychological and spiritual angst? Suddenly I realized why the ushering out of the Golden Age did not mark the death knell for Christie and the other Crime Queens yet sealed the fate of Queen, Carr and all the “humdrums” with whom my blogging buds are having a love affair right now. It has something to do with accessibility of emotion, and murder motives fit right in with that! Agatha Christie was a genius when it came to motives. In fact . . .
Christie is the Mistress of the Misleading Motive. She Makes Motive Matter!! Think about it! When you ponder the average whodunit, Ho-Ling is absolutely right to play down the importance of motive. When Sir Dibney Fotheringale invites his relations down for the weekend, the motives are trotted out as casually as the characters: his children want his money; his partner wants the business; his wife wants the partner; his valet wants revenge because thirty years ago, Sir Dibney ruined his father in a crooked South African diamond mine scheme and slept with his mother, causing the birth of triplets which ended with the mother’s death at childbirth. When Sir Dibney is found shot to death at his desk in the study, there truly is “no synergy between motive and murder method.” Whoever appropriated the gun, shot Sir Dibney, established an alibi and then killed the blackmailing butler is the killer, and the motive is tacked on without consequence. If Sir Dibney is found in his study with the doors and windows locked on the inside, the focus turns to opportunity (and JJ, Ben, TomCat, and Dan will no doubt review it). Add a mysterious mark without a weapon on the back of his Lordship’s neck and we now have a little bit o’ synergy going on here. What caused the mark? How did the killer enter and exit? All of this should come together in a boffo finale. Yet, still motivation is not an issue. In fact, motive is often merely used as a red herring: five people are holding a séance, and nobody has any motive except for the victim’s nephew, who is lurking about the area and is arrested for the crime, even though it was just as impossible for him to get inside the locked hut or the pavilion or the tennis court without leaving fingerprints in the mud or the snow or the sand as anybody else! Motive becomes the excuse for a convenient arrest while Gideon Fell or Alan Twist, et al continues to investigate. The real motive will be tossed out as an afterthought after the important stuff about the footprints and the disappearing bullet are explained. Agatha Christie wrote books like this, too – not ingenious impossible crimes but convoluted schemes where motive is irrelevant. In The Mysterious Affair at Styles, Dumb Witness, and A Pocketful of Rye, every suspect stands to gain from the victim’s death. In Murder on the Orient Express, the train is so packed with suspects that there is only room for one shared motive. Books like Sparkling Cyanide and The Murder of Roger Ackroyd trot out a variety of motives, but in the end, motive plays little to no part in the solving of the crime. At the beginning of both A Caribbean Mystery and Hallowe’en Party, a character announces that he or she can identify a murderer. That person dies, and it follows that this killer from the past is hanging out nearby. Christie uses this set-up to fine effect in one of these titles but falls way short in the other. That’s because in Caribbean, the Major’s death serves merely as the start of a rich, convoluted murder scheme where Christie dangles the pattern of motive right in front of your eyes, whereas in Hallowe’en, Joyce’s murder is purely about self-protection, and none of the history that got us here is especially riveting. Fair enough. However, more often than not, motive is an integral part of Christie’s plot. She excelled at this in several ways. First, – let’s call this Plan A – she could manipulate the reader into rejecting the killer’s clear-cut motive by forcing us to view the villain as a hero and/or victim. This is possible because every Christie character wears a mask, which allows their creator to peel back secrets, some relatively innocent, others damning. It also means that we are less likely to feel emotionally touched at the end of a Christie novel that a Brand novel, where the suspects wear their hearts on their sleeves. Thus, as I have discussed previously, the more emotionally resonant Christie titles tend to contain less baffling puzzles. Plan B involves Christie’s killer setting a trap that invites the characters – and readers – to misinterpret motive. The closest we get to a Brand-like community in a Marple story is the village of Lymstock in The Moving Finger. It isn’t that there aren’t unlikable people living there; it’s that one has to stretch the limits of suspicion to imagine any of them wreaking such havoc on the town. Christie is inviting us to apply a set of criteria – much like Ellery Queen – to fulfill the requirements of this anonymous letter-writing, maid-murdering fiend. In the end, she has led us into a trap – and it all centers on motive. She accomplishes the same goal in her serial killer mysteries, The A.B.C. Murders and Murder Is Easy, where we reject motive in favor of lunacy, which is a big mistake. The murder in The Hollow takes place during one of those weekends in the country. We know that the victim, John Cristow, is cheating on his wife Gerda with Henrietta Savernake but won’t leave Gerda due to loyalty to his wife and children. This gives both women a motive. It also supplies a motive to Edward Angkatell, who loves Henrietta but can’t compete with John. Edward’s misery gives a sort of motive to Midge Hardcastle, a distant cousin who is in love with him. And Veronica Craye, the egotistical actress next door, wants to reactivate her long-ago love affair with John and is furious when he rejects her. Oh, and there’s Lucy, the hostess, who wants everybody to be happy . . . and is willing to kill to make it so! John dies, Poirot investigates, and he eventually solves the case, exposing some twists and turns along the way. None of them, however, have to do with motivation. Everyone had his or her reason to be angry with John. For all but one of them, that anger gives way to family solidarity and love. The exception to the rule is destroyed by the wrong turn they took to alleviate their hatred. It’s pretty straightforward, and so people often criticize The Hollow as “a great novel but a lesser mystery.” Ha! Compare this to Towards Zero, which also takes place during a weekend gathering, this time at the seaside. Neville Strange used to be married to Audrey. They broke up and he married Kay. When the trio finds themselves all together at Lady Tressilian’s home, the jealousy builds intolerably. Add to this Ted Latimer, who flirts openly with Kay, Thomas Royde, who desperately wants Audrey, and Mary Aldin, who is secretly in love with Royde, and you have to pause in surprise when the victim turns out to be the kindly Lady Tressilian. We may feel sympathy for some of these people, but it doesn’t approach the depth of feeling we experience in The Hollow. However, most of us probably feel more intellectually satisfied with Towards Zero on the whodunit level. It’s not that we’re not dealing with feelings here as well: in addition to a love sextangle, we witness the grinding effect of guilt on innocent people and are treated to the machinations of a maniac. In fact, near the start of the novel, we are informed that the killer is insane, that they have killed before (as a child, no less! ), and we even have a piece of identifying information tantalizingly dangled before us (and, ironically, hidden away most cleverly). The layers are peeled away, bit by bit, until the final twist of a reveal, and no aspect of the plot is cleverer than the motive for Lady Tressilian’s murder! Plan C: Sometimes Christie doesn’t so much announce the motive as lay out the possibilities through a rich examination of the psychology of the victim. The two titles of 1938, Appointment with Death and Hercule Poirot’s Christmas, are side by side examples of this concept at its best. Mrs. Boynton and Simeon Lee control the lives of their large clans, inspiring feelings of hatred, greed, and/or desperation from all of their relations. What keeps both of these novels from being run of the mill “family gathering” mysteries is that the truth in both novels lies in understanding the victim, which in turn requires some creativity on the part of the reader in presupposing motive. I will also say this about both titles: each of them contains a trick designed to cast doubt on the facts around the murder. In that sense, they have both been labeled “impossible crimes,” which definitely fits Christmas– the other book is more problematical. What I love about these tricks is how they illustrate the ability of an author to incorporate the question of “who” and “why” into the immediate problem of “how.” They rely, in fact, on that synergy between character, motive, and opportunity that Ho-Ling rejects above – that lovely interrelationship between the questions every mystery reader asks himself which I value so much. When Christie leads us by the nose and tricks us into misinterpreting the chain of events and the motivation, she earns her stripes as the most popular mystery author of all time. That is why I love The Sittaford Mystery, which juggles so many balls in the air – the supernatural, beloved of Doyle, the Victorian horror, embodied by Bronte, the multiple motives of gain and anger and revenge and madness – that it leaves you gasping when the killer is exposed and the motive is so extraordinarily – ordinary. And that is why After the Funeral is my favorite Christie of them all. It all seems so straightforward: if Richard Abernethie were indeed murdered, as his sister Cora announces, why would anyone want to kill him except to gain his fortune? The answer to that question is concealed with great cunning at the same time that it is trotted out openly before us. In fact, there is a scene where the killer practically crows the truth – except odds are you won’t recognize that scene for what it is. There is no denying that Christie makes you work here. As Helen Abernethie reveals before she is coshed on the head, we have been expertly manipulated to see things the wrong way round; we have to correctly interpret the clues in order to see things as they ought to be seen. In After the Funeral, as in all the best of Christie’s work, motive matters! The psychology of her characters and their inherent humanity is an essential feature. And this, to my mind, is what sets Christie apart from so many of her Golden Age fellow writers. The psychological motivation that other writers rejected, or included as an afterthought, is what gives Christie her greatness. It may have been a general rule in classic detective fiction to eschew character, romance, feelings, in favor of a total devotion to puzzle. Yet Christie included all these things in the best of her work. Well, as we all know, she was a rule breaker. Yes, motive was very important for Agatha Christie. In ABC Murders, we note that Poirot is much concerned about motive. He is not prepared to accept the suggestion that the culprit is simply a lunatic. And the murderer’s whole plan is to convince the authorities that someone would kill again and again without motive. It’s imperative to the killer that the question of motive never enter into the equation! Yes, and in the 8 mansion murders, the only ultimate explanation for the method of killing is insanity ! Poirot doesn’t accept the ABC murderer merely as a lunatic because he knew there’s always a reason, a motive for everything whether it makes much sense or not. Regardless of whether the motive is big or small, there is still one. The killer does present a motive to Poirot: besting Hercule Poirot! It is to the credit of that egotistical little man that he refuses to accept this as fact! The ABC killer’s letters are directed to Poirot specifically so that the third one could be misdirected. However, Brad, you are correct; the killer was not a “lunatic” but motivated by one of the two oldest motives on earth. NTM an egomaniac who, as you note, wanted to “best” Poirot. An excellent and incredibly perceptive assessment, which deserves to be read more widely. Submit it to CADS! I agree with Tony Medawar. It is an excellent article worth publishing. I couldn’t agree with you more, Brad, about how integral motive is to Christie plots. And I love that scene in After the Funeral that you mention. It shows exactly what you’re talking about, I think. I’m thinking also of Three Act Tragedy, where you must understand the motive to put the crimes together. Fascinating! Don’t you love those ‘a-ha‘ moments? The motive for the first murder in 3AT is perhaps the creepiest in all of Christie, don’t you think? And it certainly doesn’t say much for the members of a particular profession! Oh, I agree completely, Brad. And Christie pulled that off quite well, too. It’s very creepy because she didn’t make it outlandish, if that makes sense. Creepy? Hrm… certainly yes. It is also sociopathic; frivolous and thoroughly disgusting, but creepy? Loathsome. But Christie’s portrayal of persons in the artistic and theatrical professions was always in my view, unflattering. Lady Edgeware (13 At Dinner aka Lord Edgeware Dies), (Arlena) Evil Under the Sun; (Mirelle) Mystery of the Blue Train; Amyus Crayle (Five Little Pigs); Mabelle Sainsbury Seale and Gerda Blunt (1,2 Buckle My Shoe)… have I forgotten any? Only Linda Arden (MOTOE) emerges as a heroine, albeit tragic. I often wondered if AC had a particular dislike of entertainers and artists. I agree with you. Motives in Christie’s books are usually memorable and I think that her best motive was in Curtain. I however do not completely share your enthusiasm with After the funeral. I agree that it too had a great motive and was perfectly fair-play but…. In the second half of the book, she used her favorite trick. A trick that was brilliant and a major plot element in few of her best works, but so overused that I immediately saw through it. I loved Curtain, but the fact that she borrowed it from Shakespeare kind of puts it a notch or two down. Another interesting motive is The Pale Horse. I actually found the Shakespearean inspiration kind of cool. It was the Jacobean influence in Sleeping Murder that completely gave the show away for me. Yes, the Duchess of Malfi and particularly the Duke’s great scene did sort of give it away, but I still fell for every red herring on the trail. “Carry On, Christie!” I calls it. These racy GAD covers kill me! I love the scene in the book when Susan and Rosaline are sunbathing on their uncle’s grave!!! Even the best mystery authors had to suffer this indignity. The Ellery Queen covers of the 1960’s-70’s with the live scantily clad models tried to turn it into art. I love ‘em all! 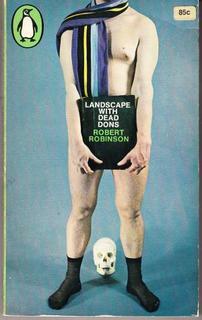 But nothing beats the one of the Green Penguin covers of ‘Landscape of Dead Dons’ by Robert Robinson – in particular, the 1966 edition. 😵😵 I have a copy of the 1983 edition, and was shocked by the 1966 cover! It makes the Ellery Queen Signet covers look relatively tame. Are you referring to this cover? Absolutely wonderful, Brad, a really illuminating look at the Blessed Agatha, full of good things. Alas, the only reason I liked WDTAE as a child was that we had basset hounds, and the name Bassington-Ffrench made me laugh. Otherwise, it’s just another hoary thriller to me with a more than obvious criminal. But lots of people love this book!! Well, I note that your article “Motive In Agatha Christie” has been published in CADS 79 (December 2018) !